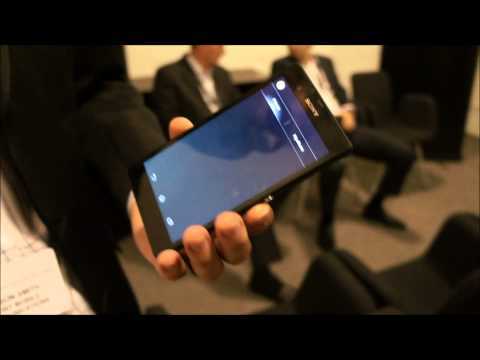 Video: Sony Xperia Z Demo…and a Quick Drop Test! At Sony Mobile’s Xperia Z regional showcase in Singapore, we also took the opportunity to get an expert to show off what the company’s flagship smartphone is capable of. Jason Smith, Director of Marketing for Southeast Asia & Oceania for Sony Mobile, took us for a quick spin around the Xperia Z’s features, from the Bravia Engine 2 technology, the amazing Exmor RS for Mobile sensor, as well as some aspects of the Sony’s as-yet unnamed UI on top of Android 4.1 Jelly Bean. Head on after the break for our impromptu drop test for the Xperia Z! Of course, one of the main concerns with a glass back is whether it is strong enough for when we eventually drop it during everyday use. Sony has mentioned that the glass on both the front and back of the device is made from tempered glass with a shatterproof film, but we’re sure that there are lingering doubts on the Xperia Z’s durability. To put it to rest, a representative from Sony Mobile sportingly allowed his prototype Xperia Z to be used as the subject of an impromptu drop test. See what happens for yourself in our video below!